Johor (last time known as Johore, Jawi script: جوهر) is a state of Malaysia. It is one of the most developed states in Malaysia. The capital city and royal seat of Johor is Johor Bahru, once known as Tanjung Puteri. The old state capital is Johor Lama. The Arabic honorific of the state is Darul Ta'zim ("Abode of Dignity'). Johor is surrounded by Pahang to the north, Melaka and Negeri Sembilan to the northwest, and the Straits of Johor to the south which is divided by the international border between Malaysia and the Republic of Singapore. Tanjung Piai, in the district of Pontian, is the most southerly point of mainland Asia. The name "Johor" came from the Arabic word Jauhar, 'gem/precious stone' . Before the name Johor was taken up, the area south of the Muar River to Singapore island was known as Ujung Tanah or 'land's end' in Malay, due to its location at the end of the Malay Peninsula. Coincidentally, Johor is the most southerly point of the Asian continental mainland. Johor has three ports: Pasir Gudang Port, Port of Tanjung Pelepas and Tanjung Langsat Port. 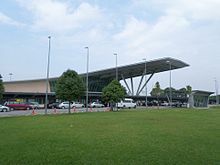 Johor has one international airport, the Senai International Airport in Senai. It was opened on 6 June 1974 and has been expanded several times ever since. Currently, it has a 5 million passenger capacity with parallel taxiway under construction. The airport is also a regional hub of AirAsia, a regional low-cost no-frills airline. Malaysia Airlines also operate flights from Senai airport to some local and international destinations. Johor is a constitutional monarchy. It was the first state in Malaysia which adopted the constitutional monarchy system, and its laws are stated in Undang-undang Tubuh Negeri Johor (Johor State Establishment Constitution), written by Sultan Abu Bakar. The constitutional head of Johor is the Sultan. This position can only be passed down and held by a member of the Johor Royal Family, who is descended from Sultan Abu Bakar. The State's Sultan since 1981 has been Sultan Iskandar Al-Haj. Johor was the first state and currently the only state in Malaysia that has its own military force called Johor Military Force or 'Timbalan Setia Negeri'. It is a private army of the Sultan of Johor paid by the state government. The state government is led by the Chief Minister or Menteri Besar. The current Chief Minister is Dato' Abdul Ghani Othman, a former civil servant. The Chief Minister is assisted by an executive council (exco), whose members are selected from the state assembly members. The legislative branch of Johor's government is the Johor State Assembly. The state assembly makes laws in matters on the state. Members of the assembly are elected every five years in an election. Johor is also known for its national parks. Johor currently has five national parks, with a combined area of more than 700 km² and several smaller recreational forest. Almost all recreational parks are based around a mountain. Johor also has the third largest mangrove forest reserve in Peninsular Malaysia (167 km²). In the official census of 2010, the population of Johor was 3.35 million people with 48% Malays, 40% Chinese, 8% Indians and 4% others. It is the fifth largest state (18,984 km²) of Malaysia. It is the southernmost state in Peninsular Malaysia being South of Melaka, Negeri Sembilan and Pahang and North of Straits of Johor. The highest point in Johor is Gunung (mountain) Ledang (1276 m). Gunung Ledang is also known as Mount Ophir. Johor is the only state in Malaysia which has a 400 km beach stretching on both the East and the West coast. Johor has 8 large islands with numerous smaller ones. Johor experiences wet equatorial weather with monsoon rain from Nov until Feb blowing from the South China Sea. Average annual rainfall is 1778 mm with average temperature of between 25.5 °C (78 °F) and 27.8 °C (82 °F). Humidity is between 82 and 86%. On 19 December 2006, continuously heavy downpour occurred in Johor. Many towns such as Muar, Kota Tinggi and Segamat were seriously flooded with water levels as high as 10 feet (3.0 m) above ground level recorded in some areas. 15 lives were lost and many possessions were destroyed and this resulted in huge financial losses in Johor. More than 100,000 victims were evacuated to flood relief centres. Johor is connected to Singapore by two roads: the Johor-Singapore Causeway and the Malaysia-Singapore Second Link. The Johor-Singapore Causeway (length: 1038 m) was designed by Messrs Coode, Fizmaurice, Wilson and Mitchell of Westminster, while the construction contract was awarded to Topham, Jones & Railton Ltd of London. It started in 1909 as a railway link by Johor State Railway to connect Johor Bahru to Singapore, then the administrative headquarters of British interests in South-East Asia. Construction of the road section started in 1919 and was completed in 1923. ↑ 1.0 1.1 1.2 "Maklumat Kenegaraan (Negeri Johor Darul Ta'zim)" (in Malay). Ministry of Communications and Multimedia (Malaysia). Archived from the original on 8 July 2018. Retrieved 8 July 2018. ↑ Mohd Farhaan Shah Farhaan (23 March 2016). "A rich legacy". Star2. PressReader. Retrieved 8 July 2018. ↑ 3.0 3.1 "Johor @ a Glance". Department of Statistics, Malaysia. Retrieved 13 January 2018. ↑ "Subnational Human Development Index (2.1) [Johor – Malaysia]". Global Data Lab of Institute for Management Research, Radboud University. Retrieved 12 November 2018. ↑ Helmer Aslaksen (28 June 2012). "Time Zones in Malaysia". Department of Mathematics, Faculty of Science, National University of Singapore. Archived from the original on 21 May 2016. Retrieved 8 July 2018. ↑ "Postal codes in Johor". cybo.com. Retrieved 8 July 2018. ↑ "Postal codes in Kluang". cybo.com. Retrieved 8 July 2018. ↑ "Area codes in Johor". cybo.com. Retrieved 8 July 2018. ↑ "State Code". Malaysian National Registration Department. Archived from the original on 19 May 2017. Retrieved 8 July 2018. ↑ Teh Wei Soon (23 March 2015). "Some Little Known Facts On Malaysian Vehicle Registration Plates". Malaysian Digest. Archived from the original on 8 July 2015. Retrieved 8 July 2018. This page was last changed on 2 April 2019, at 18:12.